Why a Custom Gun Holster? Gone are the days of messing around with an awkward and heavy gun holster. Quality craftsmanship and comprehensive customer service with spot on recommendations are what On Your 6 Designs can deliver to you the next time you are searching for a quality gun holster. Many people are given the ability to carry a concealed weapon with a proper permit and when they do this they need to be able to carry it in a concealed carry holster that is not bulky or stiff. Some people may think that the type of holster they carry their gun in doesn’t matter, as long as it is in a protected sleeve. This is simply not the case. Many people who choose to carry their concealed device want to keep it concealed in order to keep curiousity away. It is quite difficult to effective conceal a legal firearm when the holster it is in takes up a lot of space as well as making it’s appearance very obvious. For some folks, picking the right custom gun holster is a necessity because of the fact that they are going to be carrying it all day long. When a gun holster is not custom to the fit of the owner, there are many disadvantages that cause the wearing of a gun to be uncomfortable and sometimes unsafe. When someone takes the time to invest in a custom gun holster they are also taking the time to make sure that they are properly handling and concealing the firearm as best as possible. Doing so is the professional and smart way to carry a concealed weapon. Furthermore, carrying a concealed firearm with a custom holster also ensures the safety of the person wearing it as well as the people they are around. A custom holster security holds the type of firearm it was designed to protect and it keeps it from being caught on various obstructions or easily accessible by a stranger. On the other hand, proper carrying of a concealed firearm can be significantly more comfortable when done so with a custom kydex holster. There is nothing more annoying or even painful than a holster that rubs constantly on a part of the body. This can leave a painful and swollen rash which essentially can make wearing a firearm uncomfortable and in some cases impossible. 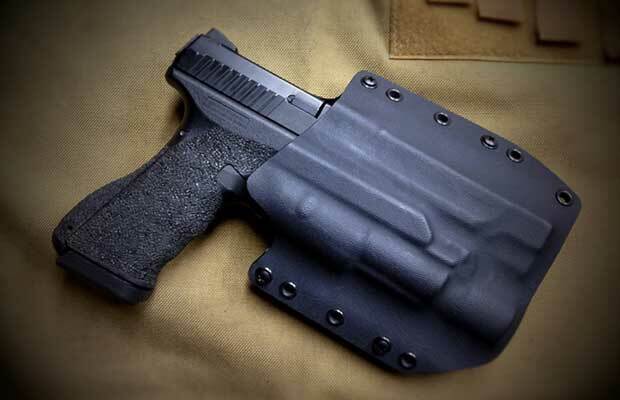 There is no one size fits all concealed holster. If someone tells you this then they certainly do not know what they are talking about. When exploring the many types of kydex holster models at On Your 6 Designs, a person needs to try various models on and evaluate how they will respond with their type of body movements and how their build can impact the ease of wearing their concealed firearm. Having a custom kydex gun holster from On Your 6 Designs is the best way to achieve a comfortable and safe method of carrying a legal concealed firearm. Protecting oneself as well as protecting those nearby is just as important as the ability to carry a firearm legally. Comments Off on Why a Custom Gun Holster?